A reader recently asked about debt to cash flow ratios when analyzing a stock, but before addressing that question, perhaps it is best to start with a definition of this staple of fundamental analysis. Debit to cash flow ratio — more simply known as debt ratio — is a comparison of a company's operating cash flow to its overall debt. The purpose of this ratio is to estimate a company's ability to cover total debt with its annual cash flow from operations. "There was an analyst on TV and she mentioned the debt to cash flow ratio of two companies. With the first company, she stated that their debt to cash flow is 17 times which is really off the charts. Normal in this time in the cycle is about 2 times debt to cash flow." The reader asked for more information on this ratio and what would be a good number to look for in a company. There are two problems here and neither is the fault of the reader. The first problem is there are numerous ratios that look a debt and a company's ability to pay its obligations. These are important considerations because a company that may have trouble paying its debts is headed for trouble and is probably not a stock you want to own. The ratios that look at this aspect of a company's finances are broadly called coverage ratios. The second problem is the formulas for financial ratios are not necessarily set in stone. Some analysts customize formulas to account for different factors. For example, a company with $15 in operating cash flow and $21 billion in debt would have a cash flow to debt ratio of 71%. Normally, you want to see this ratio above 66% — the higher, the better. However, this ratio is more helpful when placed in context. First, how has the ratio changed over the past five years or more? Is it becoming higher or lower? Second, what are the ratios for other companies in the same industry? Some capital-intensive industries may have a lower cash flow to debt ratio than other industries. You can find the numbers to calculate cash flow to debt ratio on a company's financial statements. 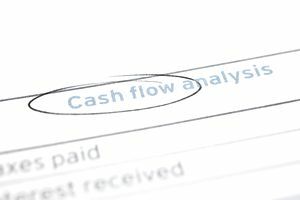 Operating cash flow is on the Statement of Cash Flows and debt is on the Balance Sheet. You will want to be careful of companies with low cash flow to debt ratios. Especially, in difficult economic times, cash flow can suffer, but debt doesn't go down. The larger the ratio, the better a company can weather rough economic conditions.